Why is this Common Core math problem so hard? It may be the first time a math problem has gone viral on the Internet. 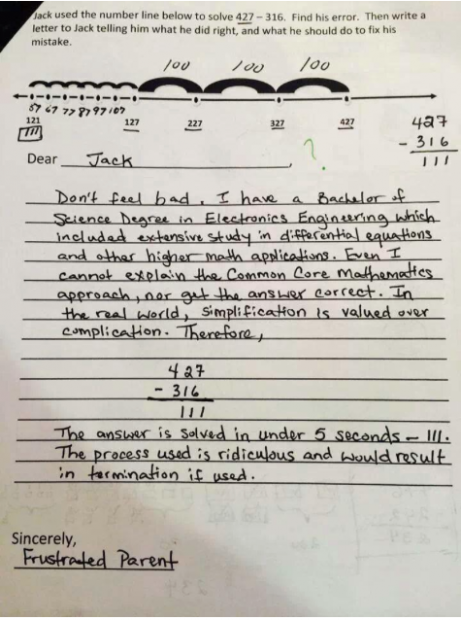 A frustrated father posted a subtraction problem from his second-grade son’s math quiz on Facebook this week with a note to the teacher calling it ridiculous. Conservative pundits, including Glenn Beck, seized on it as evidence that the new standards are nonsensical and “stupid,” adding more fuel to the backlash against the Common Core as it rolls out in schools across the country. The problem asks how Jack, a fictional student, miscalculated when he used a number line to find the answer to the subtraction problem 427 – 316. Students are then asked to write a letter to Jack explaining what he did right and what he did wrong. Critics say the problem takes a simple one-step subtraction problem and turns it into a complex endeavor with a series of unnecessary steps, including counting by 10s and 100s. The father, Jeff Severt, who has a bachelor’s in engineering, told Beck the problem was particularly difficult for his son, who has autism and attention disorders and trouble with language arts. He said that after spending two frustrating hours going over the earlier pages of his son’s math quiz, he was stumped by the problem himself. So why is the problem so difficult? 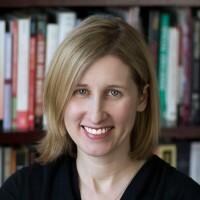 The Hechinger Report asked a couple of the lead writers of the Common Core math standards, Jason Zimba and William McCallum. Their response? Don’t blame Common Core. Blame a poorly written curriculum. “That question would not be in a textbook if I wrote it,” Zimba said. McCallum, math department chair at the University of Arizona, had some of the same concerns about the problem as the conservative critics. “It’s a complete reversal of the truth to call this a Common Core problem,” he said. What Common Core actually requires, McCallum argues, is fluency in the simple skills of adding and subtracting that critics are calling for. “Complaining that this is a Common Core method, when the Common Core doesn’t require this method, but does require the method he wants, it’s just a lie,” he added. In general, being able to explain how you arrived at an answer – not just memorizing a formula – is also one of the standards’ key goals for students. But mashing together the different standards for place value and the number line is potentially confusing. “The number line is not an appropriate model for place value,” Zimba said. The writing component is also problematic. “The standards don’t require essay writing in mathematics,” Zimba said. The problem the question highlights is not an issue with the Common Core itself, McCallum said, but rather one of curriculum. Textbook publishers, smaller startups, school districts and teachers are all grappling with how best to incorporate the standards into the lesson plans, classroom activities, homework and quizzes that students encounter on a daily basis. So far, there has been little quality control. Some of the new curricula labeled Common Core include high quality materials that match well with the standards, but many don’t, supporters of the standards say. “Like it or not, the standards allow a lot of freedom. People think the Common Core is a curriculum, and it’s not. The curriculum authors are going to interpret the standards in different ways,” Zimba said. “There will be a lot of variety, and it doesn’t make sense to me to pick one thing and say that’s the Common Core,” he added. “Particularly something that doesn’t get at the mathematics that’s being emphasized in the Common Core. Will Common Core undermine an elite college-prep program’s goal of diversity?